Mom and I are almost done with our month-long road trip across the states. It has been EVERYTHING I needed and wanted to be... and so much more. I have the adventure bug now and I know that when I get home, I will certainly enjoy my bed, but I am so ready to just go on more trips. I don't wanna sit still. I want to experience life to the fullest while I can and be stuffed full of special moments by the time I fee like settling down (if that time ever comes). The past 3+ weeks have gone by so fast and yet at the same time it seems like I haven't been home in months. I've seen, felt and done so much in this relatively short time that I am seriously a new person. I love being away from my regular routine; waking up in a different place every morning, meeting new people every day, finding alternative ways to work on my fitness, observing the similarities and differences between regions and getting creative with my food. I'll be honest: I've been eating a lot of Larabars and bananas. 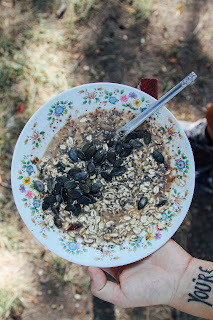 But I do have my moments where I make an effort, and this bowl of oats is an example. Although now that I am thinking about, who am I kidding. Ya just throw a bunch of stuff into a bowl and pour vegan milk on it. But whatever, I'm calling it a recipe and posting it. I hope you don't think it looks gross. I promise it's super yummy. 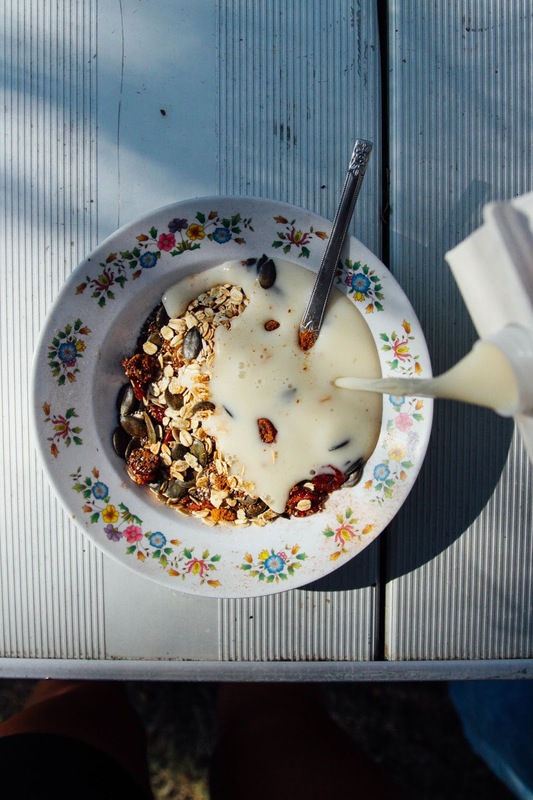 Throw all the dry ingredients in a bowl then pour in the milk, stirring it all up with a spoon. Let it sit for a minute then enjoy! Add more milk or oats if you like. Note: use as much of each ingredient as you like, it's different for me every time and still always good. There's hardly anything with oats and that is vegan that is gross to me! 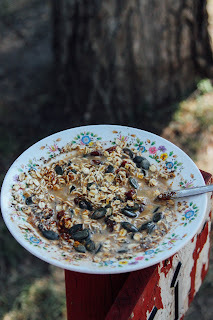 I love oatmeal and I love this simple recipe. Plus, your oat recipes are always bomb! :) What a fun trip you took with your mom—that's so awesome! Hey Emily,I have been literally eating the same thing when I camp over night at work! It does not look gross! 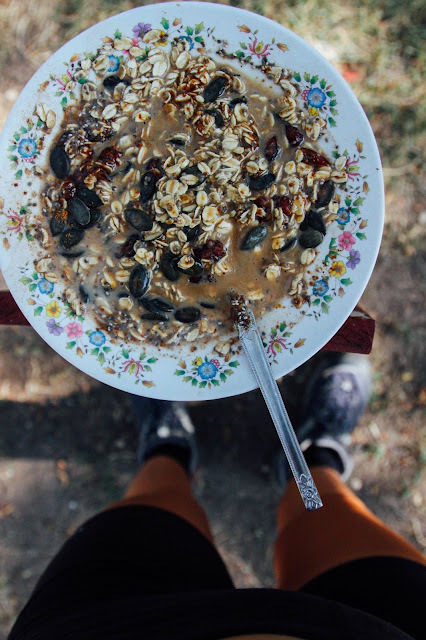 Oats are always a winner! Seems like you are going through quite an important time in your life. Adventures are waiting for you to bring nothing but new thoughts, ideas and wonderful experiences! Thanks for a great and simple recipe!